Interesting article from the November 1858 issue of The Maine Teacher about a visit to various teacher conventions throughout eastern and northern Maine. 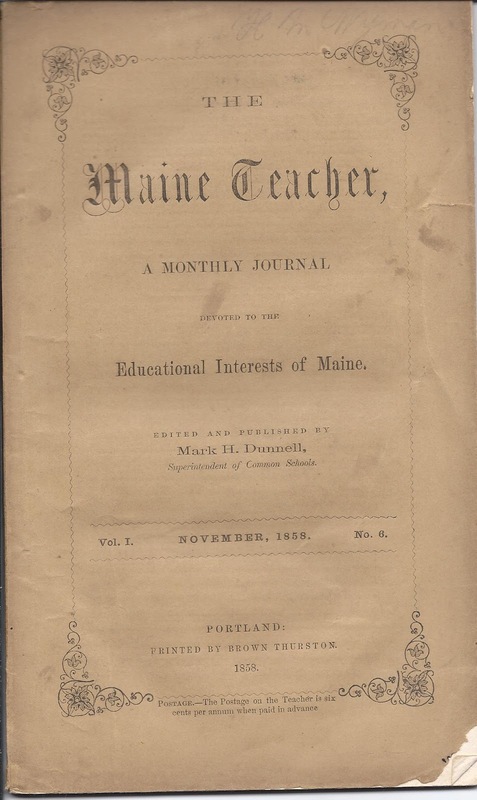 The author of the article is not identified; perhaps it was Mark H. Dunnell, Superintendent of Common Schools of Maine and editor of The Maine Teacher. The recipient of kindly offices should not fail to acknowledge them when an opportunity presents itself. 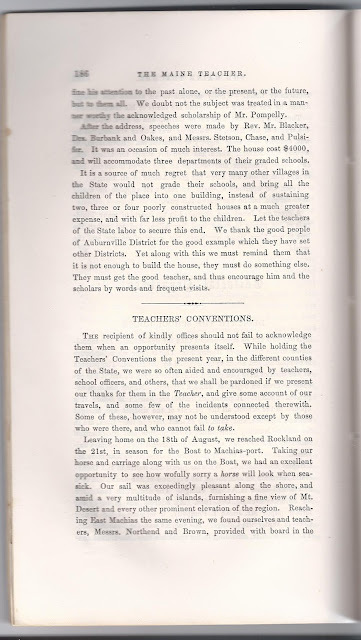 While holding the Teachers' Conventions the present year, in the different counties of the State we were so often aided and encouraged by teachers, school officers, and others, that we shall be pardoned if we present our thanks for them in the Teacher, and give some account of our travels, and some few of the incidents connected therewith. Some of these, however, may not be understood except by those who were there, and who cannot fail to take. Leaving home on the 18th of August, we reached Rockland on the 21st, in season for the Boat to Machias-port. Taking our horse and carriage along with us on the Boat, we had an excellent opportunity to see how wofully sorry a horse will look when seasick. Our sail was exceedingly pleasant along the shore, and aid a very multitude of islands, furnishing a fine view of Mt. Desert and every other prominent elevation of the region. Reaching East Machias the same evening, we found ourselves and teachers, Messrs. Northend and Brown, provided with board in the family of the Hon. M. H. Talbot, where we were received and entertained with true kindness and generous hospitality. The Convention at East Machias was not large, though composed of earnest teachers. It numbered ninety. The citiens of the place were cordial, and rendered us their sympathy and co-operation. Mr. Caldwell,the Preceptor of Washington Academy, very kindly gave an evening lecture during the session, which reflected much credit upon him as a writer, a scholar, and instructor. Tuesday morning, Aug. 24th, leaving the Convention in charge of Messrs. Northend and Brown, we started for Houlton with our horse and carriage, going through Marion, No. 18 and No. 14, in season for a dinner with Aunt Jane Sawyer of Cooper, whom to know is but to love, for her words and acts are all kindness and good will. We remembered her, for in 1855 we were made to experience her goodness in timely administration of medicines to us when falling sick at her house. May she live these many years. Passing through Alexander, Princeton, No. 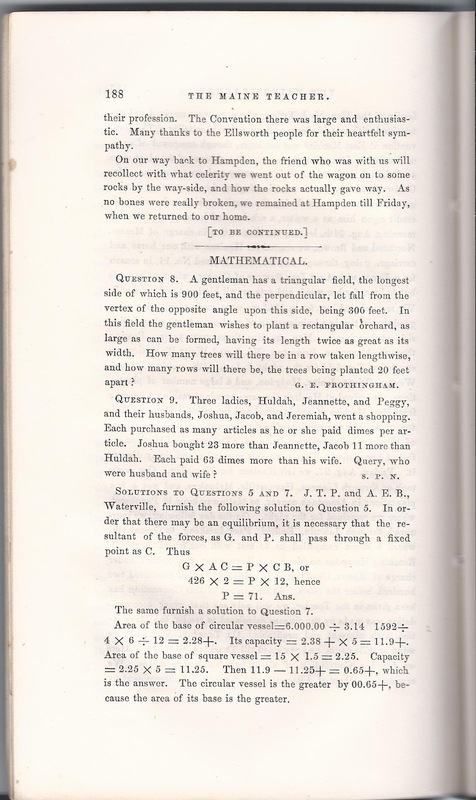 2, and Waite Plantation, we stopped at Topsfield for the night. 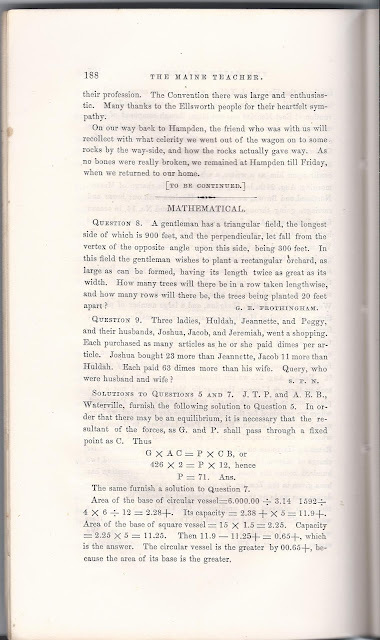 Aug. 25th, passing through Weston, Orient, Amity, Hodgdon, and a large number of plantations, we arrived at Houlton the same evening, making a journey from East Machias of one hundred and ten miles. Here at Houlton we found a Convention of eighty members, under the charge of Messrs. Chadbourne and Brickett. The people at Houlton are full of hospitality. They have this reputation and richly deserve it. Friday, Aug. 27th, we left Houlton for Hampden. Our route took us through Linneus, Haynesvlle, Molunkus, and not a few plantations in Aroostook County, to Mattawamkeag in Penobscot, where we remained for the night. On the day following, we journeyed through Lincoln, Enfield, Passadumkeag, to Greenbush, where a storm compelled us to rest with our friend Campbell. Reaching Hampden on Monday, a Convention was opened under charge of Messrs. Chadbourne and Brickett, which numbered two hundred before the close. As an account of this Convention has been given in the Teacher, we will only say that every accommodation was made by the citizens calculated to render the Convention both pleasant and profitable. 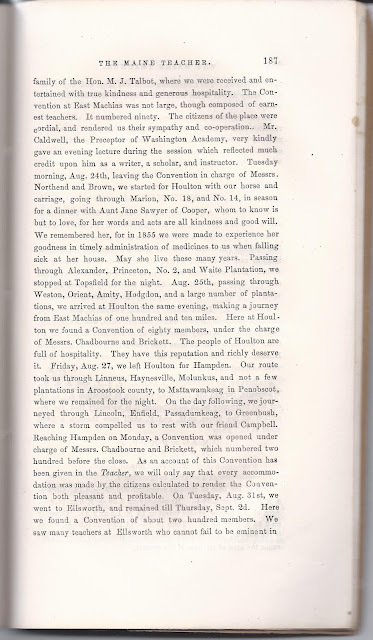 On Tuesday, Aug. 31st, we went to Ellsworth, and remained till Thursday, Sept. 2d. Here we found a Convention of about two hundred members. We saw many teachers at Ellsworth who cannot fail to be eminent in their profession. The Convention there was large and enthusiastic. Many thanks to the Ellsworth people for their heartfelt sympathy. On our way back to Hampden, the friend who was with us will recollect with what celerity we went out of the wagon on to some rocks by the way-side, and how the rocks actually gave way. As no bones were really broken, we remained at Hampden till Friday, when we returned to our home. Sadly, I don't have the next issue to provide the ending to this account. Hon. M. J. Talbot, with whom the wayfarers stayed at East Machias, was likely Micah J. Talbot, son of Peter Talbot, Jr. and wife Lucy (Hammond) Talbot. He was born 18 May 1787 at Machias or East Machias into a distinguished family of lawyers and businessmen with lumbering and shipping interests in Maine and beyond. Many of the Talbot family papers are held at Fogler Library at the University of Maine, Orono, Maine. Micah married Betsey Rich in 1809. She was born 6 March 1784 at Machias, Maine, daughter of Samuel and Sarah (Bracey) Rich. The couple had, I believe, nine children: James Rich Talbot; Josiah H. Talbot; Samuel H. Talbot; Joseph Harris Talbot; Peter S. J. Talbot; Betsey Jones Talbot; James Rich Talbot; Micah Jones Talbot; and Francis Loring Talbot. As for Aunt Jane Sawyer of Cooper, Maine: I believe she was Jane Christy (Waterhouse) Sawyer, born 13 March 1800 in New Brunswick (though some records say Machias, Maine). Her parents were Elias and Martha (Greenlaw) Waterhouse. Elias was born in Machias, Maine, but records differ on Martha, with some indicating Massachusetts and at least one pointing to Deer Island, New Brunswick. On 2 April 1818 at Machias, Maine, Jane married Nathaniel Sawyer, a New Hampshire native. He was born 21 November 1784, the son of Nathaniel and Prudence (Abbott) Sawyer. Whether or not the couple had children I don't know. In the 1880 Census, widow Jane was listed as "grandmother" in a household headed by Nathaniel Gates Sawyer, son of Asaph and Alice Crain (Allan) Sawyer. Asaph was the younger brother of Jane's husband Nathaniel, so Nathaniel Gates Sawyer would have been her grand nephew by marriage, not her grandson. It's possible that his wife Charlotte was Jane's granddaughter or that the enumerator made a mistake. Jane's husband Nathaniel Sawyer died 20 June 1875 at Cooper, Maine. Jane, who had gone on to have the many more years of life wished upon her by the author of the 1858 article above, was still living at the time of the 1880 Census of Cooper, Maine, though an invalid suffering from paralysis. If you have any corrections or additions regarding any of the above information or insights regarding the people mentioned in the article, please leave a comment or contact me directly.